"When we talk about you cannot ask for a yellow card during the game, [what about] asking for a red card before the game?" Rafa Benitez has called for the FA to review Wilfried Zaha's comments he would have to break his leg before anyone gets a red card for fouling him. The Newcastle manager insists he has faith referee Andre Marriner will not let Zaha's comments affect his judgement when he officiates their game against Crystal Palace on Saturday. Sky Sports News has been told Premier League match officials will not change the way they referee incidents involving Zaha, despite his passionate plea for protection. Benitez said he was "surprised" by Zaha's comments. "He's a good player no doubt about that but I think the FA has to deal with his comments," said Benitez. "I'm sure that Marriner will not have this in the back of his head. Do reputations precede Zaha and Neymar? "He has a lot of experience, even if his record is not the best in terms of red cards, but I'm confident he is a very good referee with a lot of experience and he will deal with the situation in a normal way." 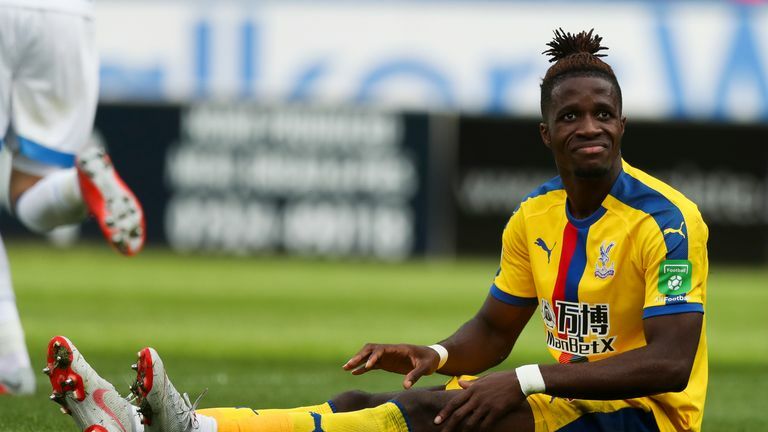 Zaha made the claim after he was pulled to the ground by Huddersfield's Mathias Jorgenson, who was booked for the incident, during Palace's 1-0 win over David Wagner's side. Sky Sports News understands the Professional Game Match Officials Limited (PGMOL) believe Watford's Etienne Capoue should have seen red for raking his studs down Zaha's calf in the Eagles' 2-1 defeat at Vicarage Road. He has been fouled 11 times so far in the current campaign and was one of the five most-fouled players in the Premier League last season. I don't think it will make any difference for our players, and especially for the referee. Asked if Zaha's comments will affect the Newcastle players, Benitez said: "No chance. The way that he plays normally he will receive more tackles than other players because he likes to run against players. "He has the pace, the ability because he is a great player - but I don't think it will make any difference for our players, and especially for the referee. "You could have maybe 20 players in any competition talking about the same thing if you want. Players of his ability normally they are exposed to these things and it's the job of the referees to protect them and to protect anyone in the game. "When we talk about you cannot ask for a yellow card during the game, [what about] asking for a red card before the game? "It's not something we can control but maybe someone else will make a point."